My favourite way of making New Year Resolutions is to write down at least 10 things I want to do over the following year. The idea behind this is that with a lot of goals you have a good chance of getting at least some of them done by the end of the year. How did I do in 2014? Well, here's what I hoped to do, what I succeeded at, what I attempted and what I failed to do completely. Explore one of London's Magnificent Seven cemeteries that I haven't already visited. Over the past few years I've slowly been visiting each of London's famous Victorian cemeteries, known as the Magnificent Seven. I'd already explored Highgate, Nunhead, Brompton, West Norwood and Abney Park in previous years, so just before Samhain I went to Kensal Green Cemetery. That only leaves Tower Hamlets still to visit, so guess what will be number one on my New Year's resolutions list for 2015? Visit the remains of the London Mithraeum and the items in the Museum of London. I did my best. Sadly the Mithraeum itself is out of bounds as more archaeological excavations are taking place, but I got as close as I could and I did see the wonderful statues from the Mithraeum that are on display in the Museum of London. You can read my blog post about the day out here. I went to the Rollright Stones at the Autumn Equinox for a lovely ritual in glorious autumn weather. It is a beautiful stone circle and a great place to go for a seasonal rite. Go to the Day for Patricia Crowther in Nottingham. Time and money issues meant that I couldn't get to the Day for Patricia, which I am really sad about. Visit the Viking Exhibition at the British Museum. This was a great exhibition and I enjoyed it - although it was very crowded. You can read about my favourite bits here. No, even though I certainly would have had time to do this I didn't get round to it. Maybe next year. Listen to Sandra Ingerman’s Shamanic Meditations. Although this CD was given to me as a Yule gift in 2013, I finished listening to the last one just before Yule this year and wrote a review. It counts as a resolution done though. Back in the summer I went on a psychogeography walk around my town - then later on I gave a talk about psychogeography at the PF London Conference. Go to an outdoor ritual for the Summer Solstice. No, although I got to outdoor rituals for Imbolc, Autumn Equinox and Winter Solstice, I didn't celebrate the Summer Solstice outdoors. I can't really think of a good excuse for this either. Visit at least three ancient pagan sites in Scotland. 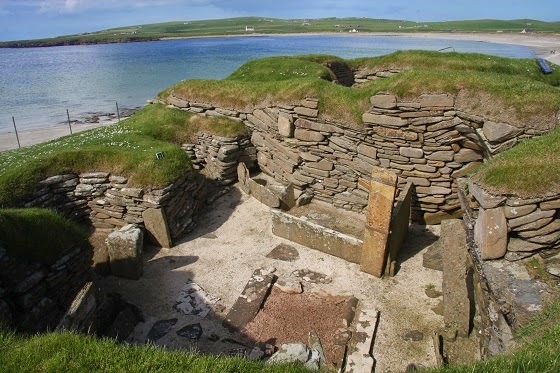 In the summer I had a holiday planned in Orkney and I went to several amazing pagan sites including the Stones of Stenness, the Barnhouse, Maeshowe and Skara Brae. I make that 6.5 out of 10. I'll be writing my New Year Resolutions for 2015 over the next few days and I'll post my list on my blog.